The ChesterBelloc Mandate: Taxes: Fair or Foul? Somewhere in the Analects of Confucius, the Master says that the first step in solving a problem is to call things by their right name. When things are mislabeled, it is very difficult to think about them correctly. On the other hand, if you do not wish people to think correctly about an issue, the first step is to mislabel things. If you deliberately wish to confuse people, you can start in no better place than to give things the wrong name. A name describes what a thing is, and if you wish to conceal from people what that thing is, then call it something it is not. However, mislabeling things does give a clue to the fact that someone is trying to mislead you. If someone is afraid to call something by its right name, then they are afraid that people will find that thing fearful. Which brings us to the 30% National Sales Tax. I use this name because it describes what the thing is. But if you have not heard of it before, it is because the supporters of this idea do not call it by this name. They are afraid that any name which accurately describes it would certainly cause people to fear it. And I am afraid that they are right. The name they have chosen is one that gives an opinion about the tax, rather than describe what it is. One is certainly entitled to one's opinions; one is not entitled (this side of Karl Rove and George Bush) to misuse the language. And the opinion they have rendered on their own plan, the mislabel they have chosen for it, is the “Fair” Tax. I am not concerned, for the moment, with whether this opinion, rendered as a “name,” is accurate. My concern for the present moment is why they chose this particular bit of propaganda for their moniker. The reason is simple: they have perceived, quite correctly, that fairness is a basic principle of a just tax system. Now, I do not know what standards the backers of this tax use to render the judgment of fairness on their plan. I have searched their web site (www.FairTax.org) in vain for a definition of “fairness.” So I will have to supply my own. And I believe that we can define fairness as justice. But what is justice? Obviously, there are many different notions of what constitutes justice, but I believe that they all have one thing in common, namely the idea that what one gets should be proportional to what one gives, that one's rewards should be commensurate with one's contributions. There is not much dispute, I believe, about this principle. However, the devil is in the details. No one will quarrel with the proposition that if you spend a dollar, you should get a dollar's worth of goods; if you pay for a pound of ground beef, you should get a pound, and it wouldn't be just if the butcher had his thumb on the scales. This is justice in exchange, or what Aristotle called commutative or corrective justice. This kind of justice deals with exchanges between individuals or between firms acting like individuals. But there is another kind of justice called distributive justice, which deals which how collective entities (a family, a company, or a state) distribute their corporate products to the individuals that make up that collective entity and contribute to it. And it is a fairly well established principle that rewards from the corporate entity (the state, in this case) should be distributed in proportion to the contributions each individual makes. Now, there are many different kinds of contributions to the common good (which is, or should be, the “product” of the state). There are soldiers to protect us, nurses and doctors to heal us, mothers to give us life and serve as our first teacher, entrepreneurs to create new wealth, and so forth. It is difficult to judge the relative merits of each of these contributions, but we know that life would be more precarious, or even impossible, without the contribution of each of these people. Hence we know that it is in our best interests to see that each person is properly rewarded for their contribution to our comfort and well-being. There is another kind of contribution to the common good that we all make, one way or the other, and that is the contribution of money to pay for the whole thing. This brings us (at last) to the question of taxes. Who should pay, and how much? I think the answers are: “Everyone,” and “In proportion to the benefits they receive.” Now, we don't have to worry too much about the first point, since many taxes will be passed on, one way or another, in the prices we pay for things. Hence, everyone will pay, even if taxes are not directly collected from everyone. It is the second point that is the interesting one, since we receive different levels of rewards from society and from government. For example, the police are there to protect us in our persons and our property. Now, we all have the same “property” in ourselves and receive the same benefit (in theory) from police protection. But we have differing amounts of property in “things.” Some have very little, but others have a great pile of things, and derive greater benefit from the protection of those things. Clearly, they receive a greater benefit and should pay a larger proportion of the costs of police protection. Now, even with a flat-tax, the rich will pay a greater amount, but should they also pay a greater proportion of their income? This brings us to the great debate about taxes: Should they be regressive (the poor pay a larger proportion of their incomes), flat (everybody pays the same percentage), or progressive (the rich pay a larger proportion of their income)? Each of these answers embodies a different ideal of justice. Here we cannot reduce things to a rule (as we could in the case of simplicity) but must make a judgment about what constitutes justice. A regressive tax embodies the ideal of the ruling class as the leaders of society who should receive the bulk of the rewards. At its most extreme, regressive taxes express the ideals of a slave society, since you can regard the slave as someone who is taxed at a 100% rate, minus some “prebate” equal to the level of subsistence the that the master is willing to give to the slave. One would think that regressive taxes are excluded from a democratic society, but in fact many of our tax structures are regressive. Sales taxes are one example. Another is the differential rates of taxation for income from capital and labor. Labor is taxed at a higher rate than capital gains, which is regressive because the rich tend to make a higher percentage of their income from their capital rather than their labor. A flat tax embodies abstract ideals of economic and political equality; each person is deemed to be rewarded by the economic system in a manner proportional to his or her efforts. As such, the flat-tax has some appeal from the standpoint of the ideals of equality. However, the evidence that people are rewarded in exact proportion to their contributions and productivity is weak at best, and flat contradicted at worst. Look at the following chart (click on the chart to get a clearer view). 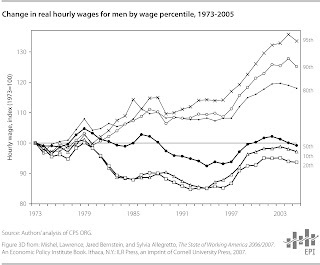 What it shows us is that median wages (adjusted for inflation) have been flat since 1973. Yet in that same time-frame, productivity for all classes of workers has increased dramatically. What has happened is that one relatively small group has appropriated to itself all the gains arising from increased productivity; the connection between contributions and rewards has been broken. Now, while there may be good arguments for a flat tax in the case of taxes on wealth (land taxes, for example), these arguments are weak when applied to incomes, at least in the concrete situation in which we find our society. This is not only a violation of basic justice, but has deleterious practical consequences as well (see The Investor's Dilemma and The Investor's Dilemma II). This would seem to leave progressive as the only system that would meet the standards of fairness and justice, at least, in our current situation. Those who receive a disproportionate share of the rewards should contribute a disproportionate share to the upkeep of the commonweal. Both the 30% National Sales Tax and the Flat-Tax proposals make a nod in the direction of progressive taxation, the former by establishing a universal welfare program that prebates the sales taxes up to the poverty level, and the latter by a standard deduction equal to the poverty level. In the case of the Flat tax, the degree of progression is trivial. Further, since the tax only replaces the income tax and leaves the FICA taxes in place, it ends up being regressive. A worker will pay the 17% flat tax, plus the 7.65% payroll taxes. A self-employed person (like myself) will get a flat tax of 32.65%, which is close to the marginal rate for the richest Americans, and I am by no means rich. Further, since the FICA taxes stop at about $90,000, the resulting structure is regressive. In the case of the National Sales Tax, "progression" is an outright lie. The “progression” comes only if you assume that the rich convert all of their income to consumption, which is patently untrue. At the extreme, a man like Warren Buffet has difficulty converting even 1% of his income into consumption; therefore his tax rate will equal 23% of 1%, or 0.0023% of his income. This is a rate more compatible with a class-based or even a slave society than with a democratic nation. Obviously, there can be different judgments about justice; it is not something that can be calculated, but must resolve itself back to some basic, but “unprovable” notions about the kind of society we want. But I do believe that any discussion will have to take into account the factors that I have mentioned here, namely the proportion between the benefits one receives and the contributions one makes.